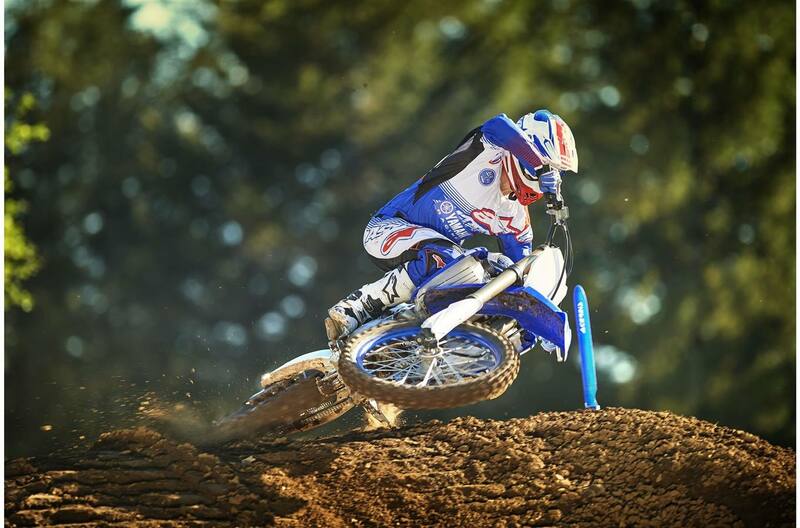 Be ahead of the pack when the gate drops with the 2018 YZ450F! 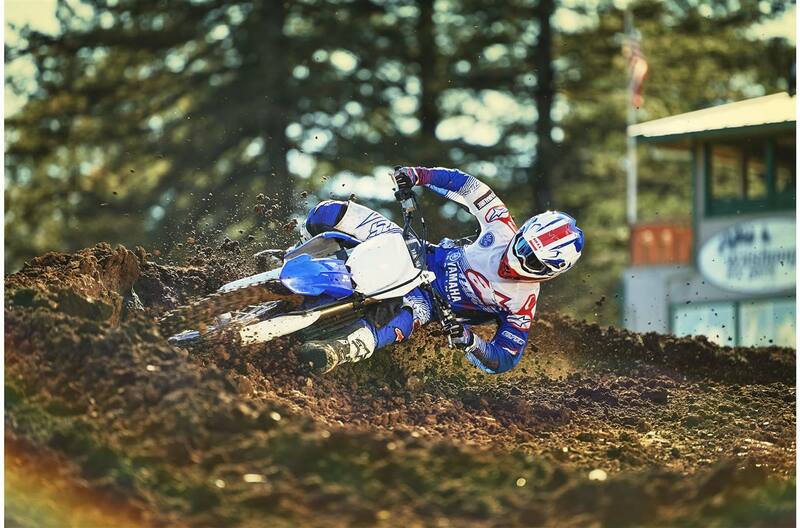 The ultimate motocrosser gets a host of updates giving it more competitive power with the push of a button thanks to the addition of electric start. A newly developed chassis, head-turning style, and an all-new Power Tuner app to fine-tune engine settings right from your smart phone will get you on top of the podium box. 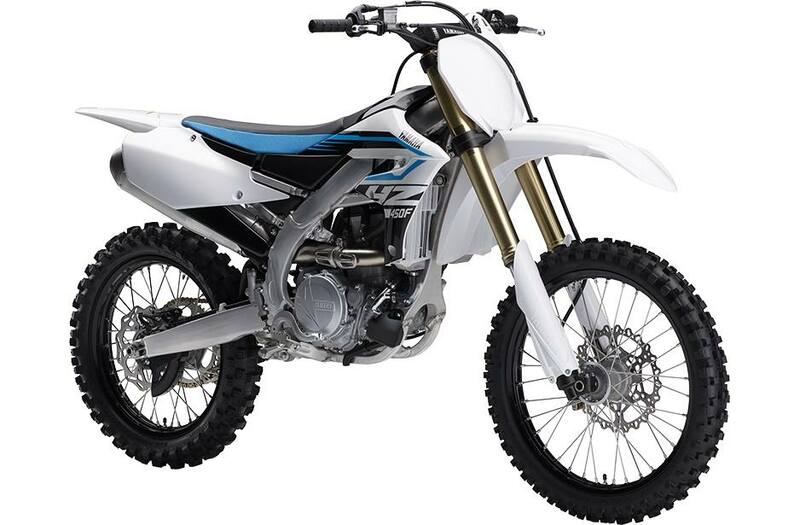 Power: The 449 cc reversed, rear slanting engine receives a new intake port design and new piston head with optimized underside rib shapes making it lighter and stronger. 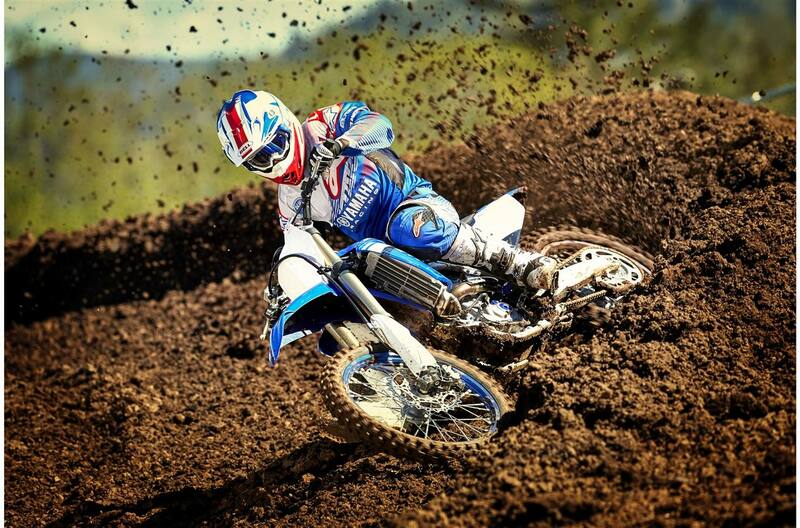 The result is a higher compression ratio at 12.8:1 delivering a more competitive power. 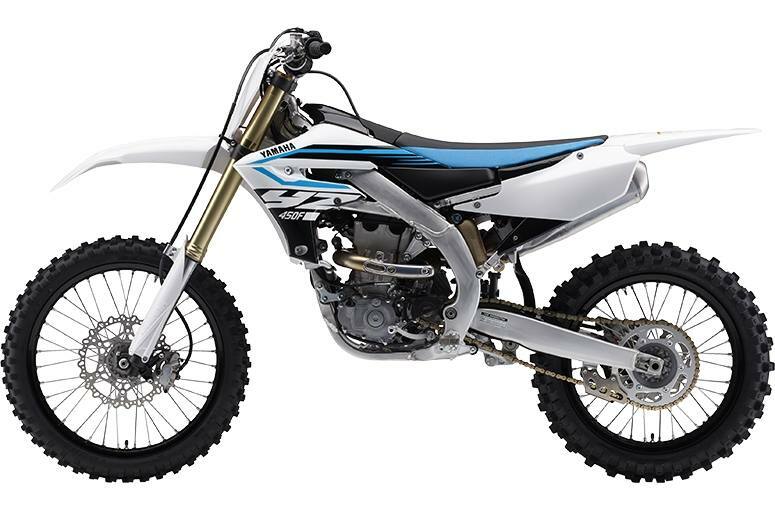 Chassis: To enhance handling and heighten performance on rougher terrain, the bilateral beam frame of the new 2018 YZ450F has been updated to include a straight-line fuel tank rail, re-positioned tension pipes, and newly positioned engine mounts. 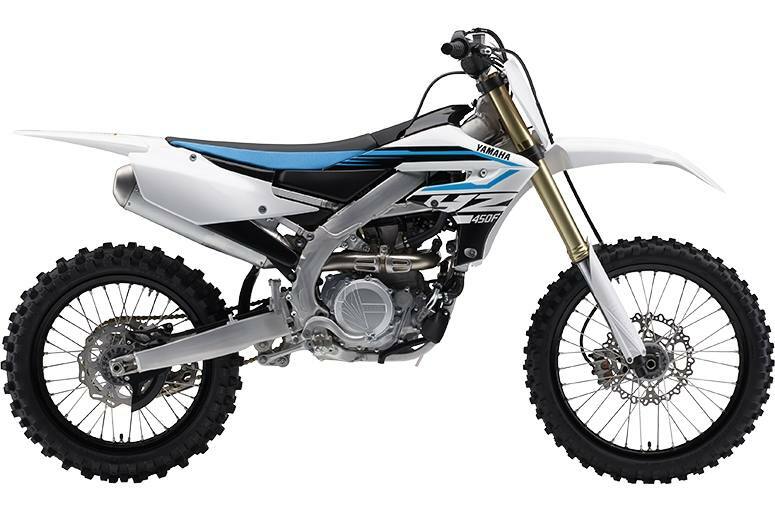 A lightweight, slimmer air cleaner box combined with a new compact fuel tank and seat gives the rider greater freedom to move around while searching for optimal body positioning. 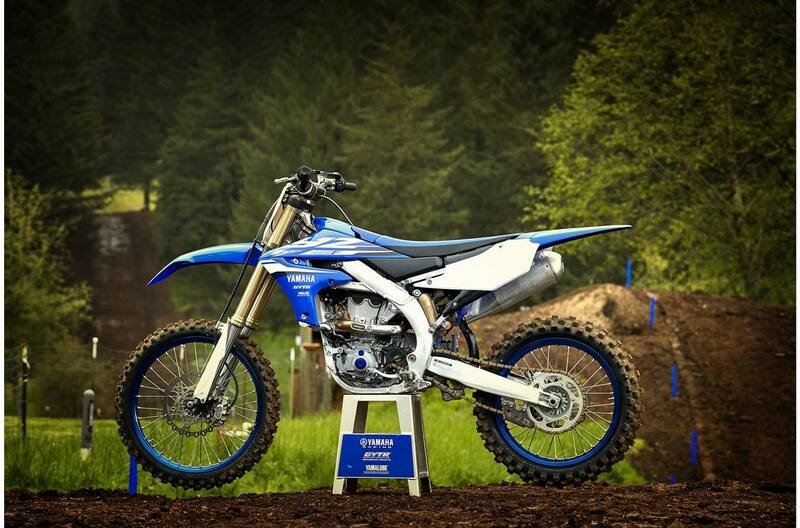 Styling: Newly designed air ducts, side covers, and more visually aggressive front fender highlight the styling changes for the 2018 YZ450F. 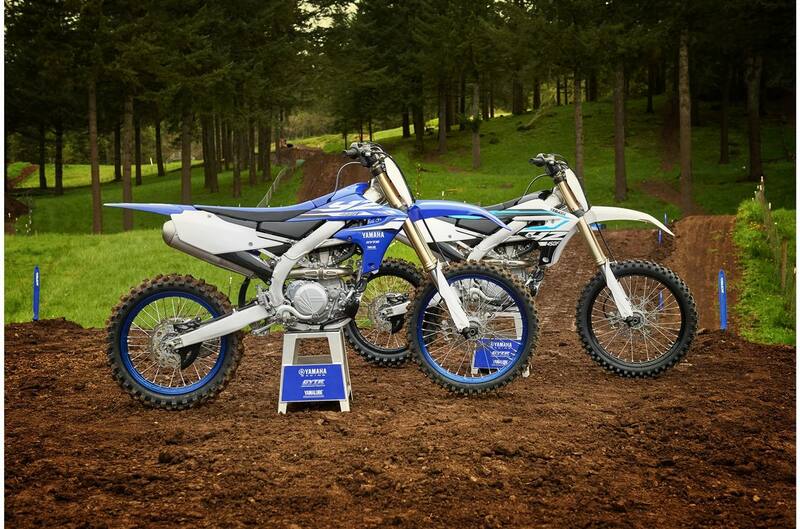 Two colour variations are available including the traditional Yamaha Racing Blue and a fresh look on the secondary option with a white, cyan, and black colour palette. 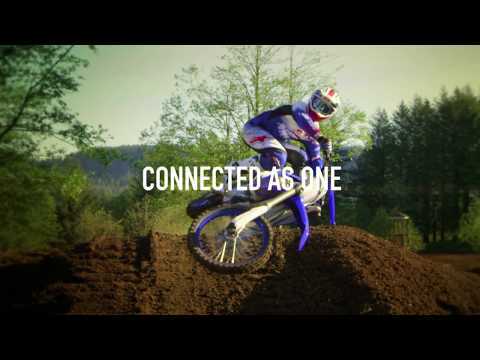 Power Tuner App: The new Power Tuner app with expanded functions for the YZ450F not only makes it easy to modify the fuel maps directly from your smart phone, but also allows you to share settings among your team or with friends. The easy to operate Power Tuner app was developed to work on both Apple and Android platforms and is available as a free download from either the Apple App Store or Google Play. Revised, heavy duty clutch with quick access magnesium outer cover & on the fly "barrel adjuster. 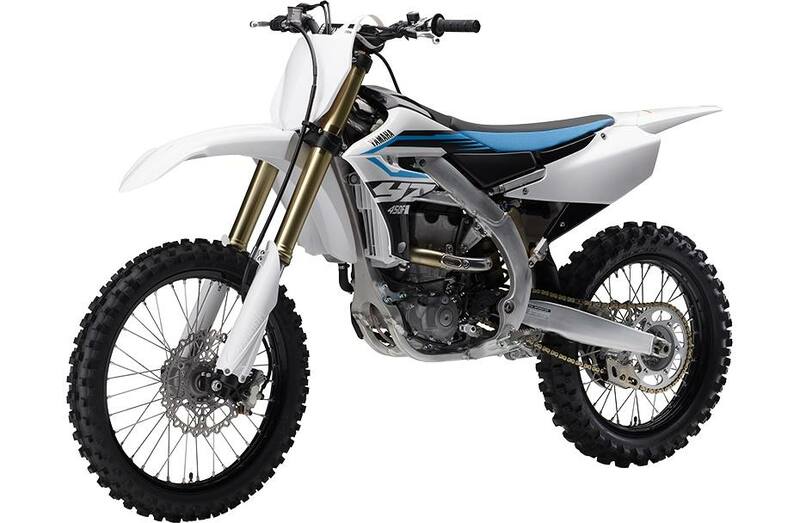 ": revised pressure plate features new reinforcing ribs for improved clutch feeling; revised clutch springs & specially machined steel plates; quick access outer cover provides fast & easy clutch access; light lever pull for reduced hand fatigue during a long moto; works-style race-spec "barrel adjuster" for on-the-fly clutch lever free play adjustments. The injector spray pattern, spray direction and the distance to the intake valves have been optimized. Forward mounted straight intake tract helps to maximize the benefits of the FI system & overall power output: super convenient, smart phone based power tuner; no "hard" link required between the unit & smart phone... wireless signal via Wi-Fi; app is free... will work with either ISO or Android platforms; receiving communication control unit (CCU) is located under left side cover of bike; expanded adjustment range ? 16 settings for both fuel injection duration & ignition timing; new "real time" machine monitoring function (engine rpm, throttle angle, battery voltage, coolant temp, intake air temp, outside air pressure, etc. ); new maintenance function ? reminds you when scheduled maintenance is required; new race log function is available to record & save settings from various tracks; tuning maps & race logs can be shared via email, Air Drop etc. All new, smart phone based, wire-less, "Power Tuner" with expanded functions: super convenient, smart phone based power tuner; no "hard" link required between the unit & smart phone... wireless signal via Wi-Fi; app is free... will work with either ISO or Android platforms; receiving communication control unit (CCU) is located under left side cover of bike; expanded adjustment range ? 16 settings for both fuel injection duration & ignition timing; new "real time" machine monitoring function (engine rpm, throttle angle, battery voltage, coolant temp, intake air temp, outside air pressure, etc. ); new maintenance function ? reminds you when scheduled maintenance is required; new race log function is available to record & save settings from various tracks; tuning maps & race logs can be shared via email, Air Drop etc. Launch control system (LCS): provides smoother, quicker starts with less wheel spin & front wheel lift; allows rider to concentrate on clutch control, body position & machine; system functions in 1st & 2nd gears only and is disabled when the bike is shifted into 3rd; ECU controls the system and adjusts engine rpm to limit wheel spin & wheelies; activation button is on the LHS handlebar & features a LED indicator light. 245 mm rear disc brake features a "wave-style" disc & single piston Nissin caliper: revised rear rotor for improved heat resistance; rear caliper & lower portion of the disc are protected by heavy duty plastic protectors. NOTE: Lithium ion batteries must be charged using the correct type of charger. 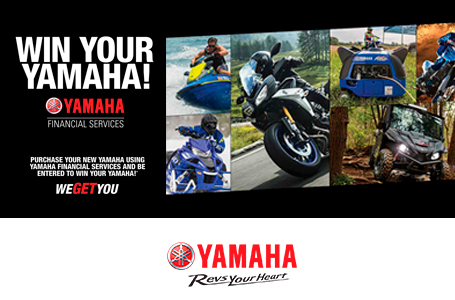 Yamaha recommends using only the Optimate Lithium TM291 battery charger. Do not use a high powered, lead acid charger or an automatic de-sulphating lead acid charger or serious battery damage will occur. Never use jumper cables to start the engine connected to a lead acid battery.